We welcomed our 4th baby this summer who’s gender was a complete surprise until birth! 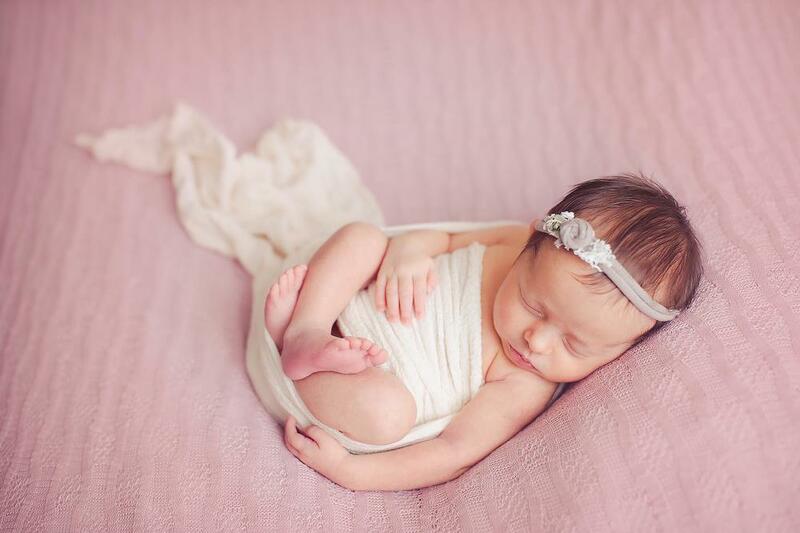 Portlynn Blake was born at the end August and I still can’t get over the shock that she is a beautiful little GIRL! I had convinced myself she was a boy throughout my whole pregnancy! SO much that my husband was thinking the same thing too! Much to our delight she is indeed a beautiful little girl that evens up our crew of 2 boys and now 2 girls! We could not be more thrilled to welcome her sweet little spirit into our home! She came a month early and spent 10 days in the NICU so it was even more special when we finally were able to take her home from the hospital! 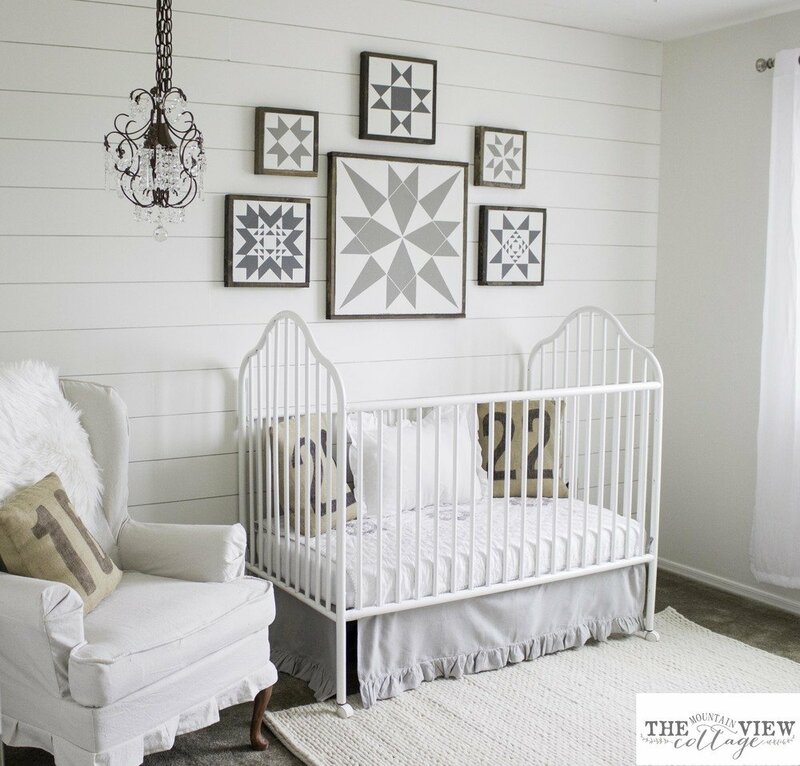 The starting point for this nursery was the walls. 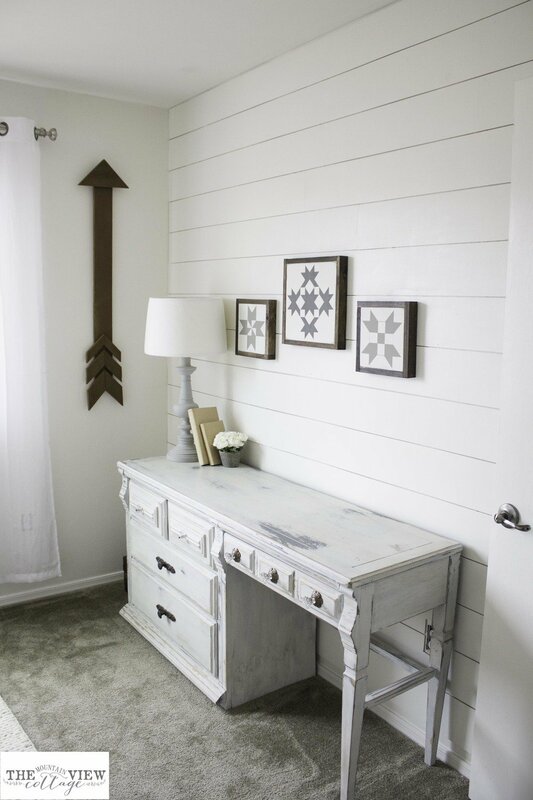 I knew from day one I wanted to do some Joanna Gaines inspired ship lap walls, and paint everything white! this was such an easy project but did require 2 people! Thankfully my husband is a total trooper and we got this part done in about 3 days (with lots of breaks and time with our 3 kids in between). 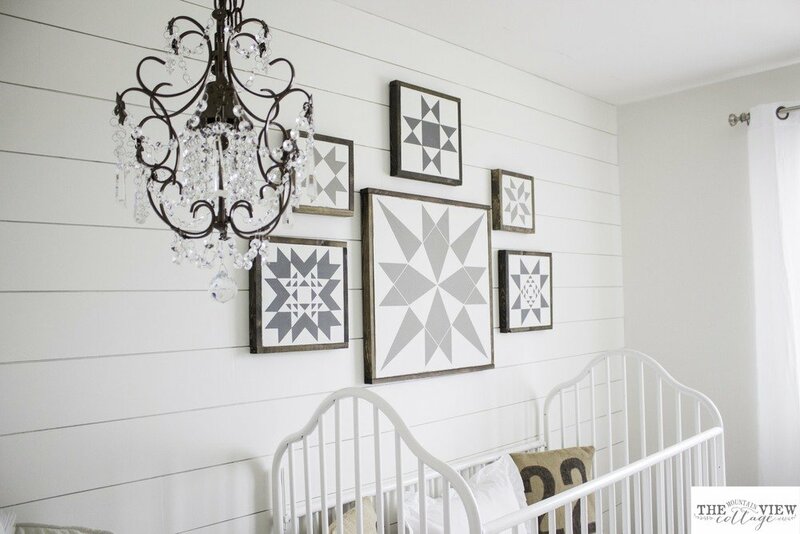 There are plenty of tutorials on how to achieve this look so I wont go into detail extreme detail,we painted the whole room white and then used a nail gun to adhere the 6.5 inch x 8ft strips to the wall staggering them so that the seams didn’t mach up on the following rows. I then filled in the holes with wood putty, and painted the planks the same white color on the walls which is swiss coffee by Sherwin Williams. The wood was 4×8 foot sheets of $13 wood with a smooth surface we cut into planks our self from Home Depot. Once that part was complete the rest was a lot of fun! I made all of the quilt block inspired signs, and used other odds and ends from our home including all the pillows, and the fur rug I already had. All the pillows I sewed myself, and the rug is from Home Goods. The cable knit rug on the floor I got 75% during thier mothers day sale and I love it! 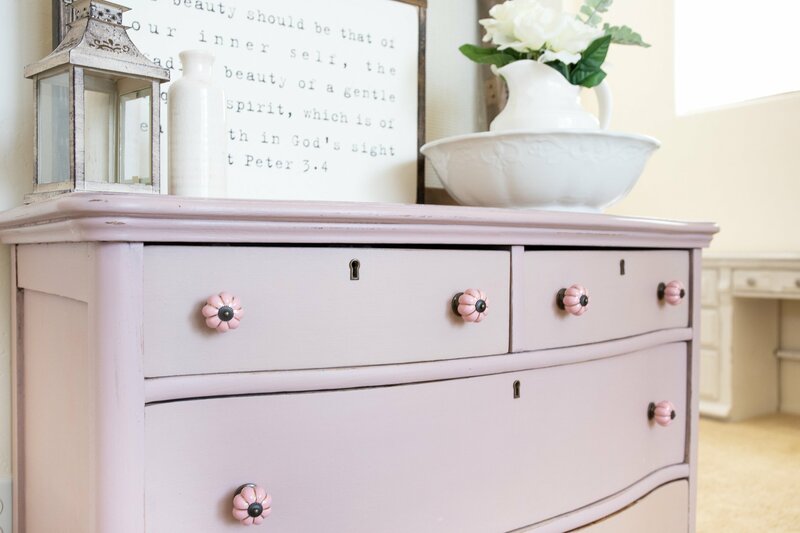 Its super soft and adds an extra gentleness to the space. 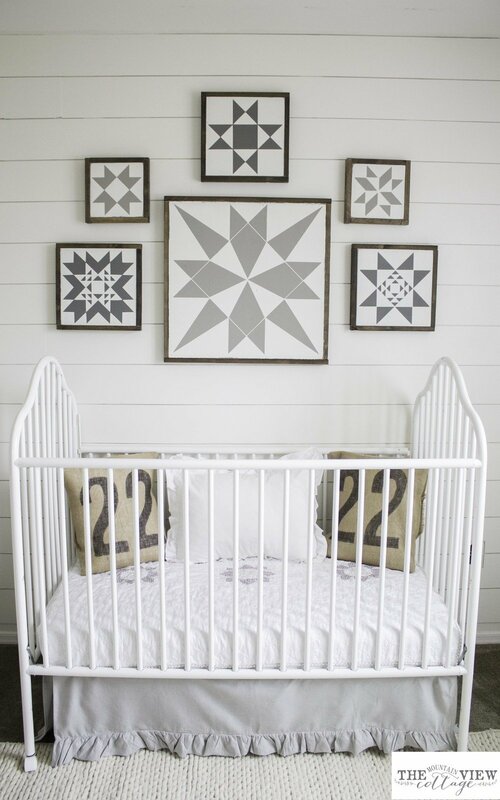 The crib skirt was my one splurge item and is from Restoration Hardware Baby and Child. The arm chair I literally snagged off the side of the road for free, and used a $20 paint drop cloth to cover it myself. That was probably the hardest project in the whole room hands down! 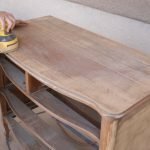 The desk was also another free side of the road treasure I re-painted with grain sack Miss Mustard Seed Milk Paint a few summers ago and was actually already in the room. The curtains were also already in here, the rod is from target and the drapes are from Ross. 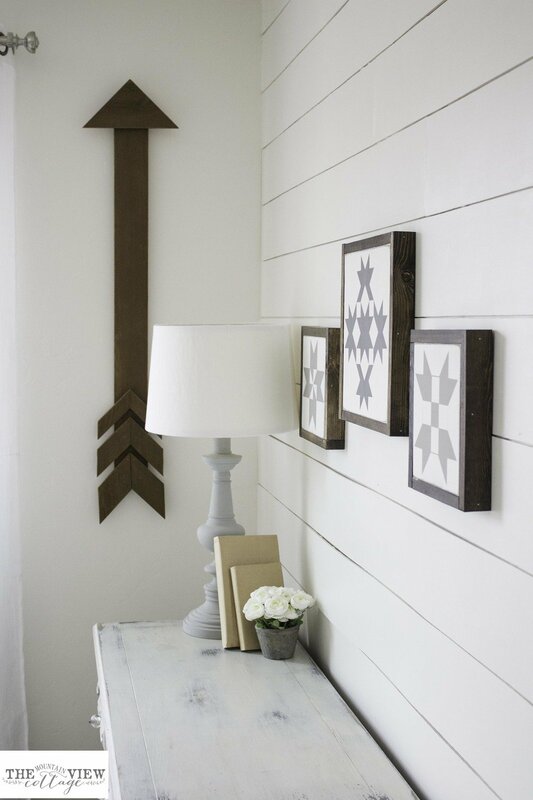 The arrow is from Rustic Nest on Etsy! and was such a fun addition to the space! 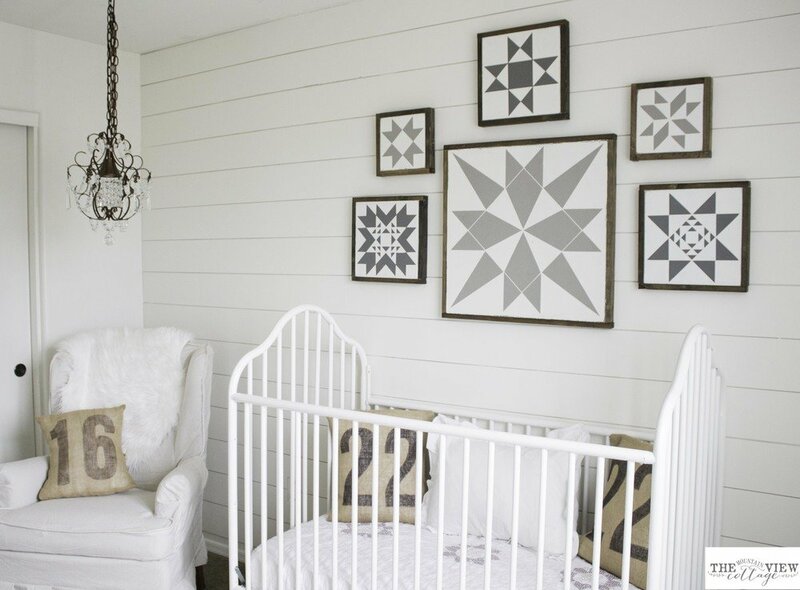 The quilt was a custom piece from my dearest Rachel and there are lots of others from her in our shop! That pretty much sums up the space! I am so pleased with how it turned out and and am totally planning on doing lots more planking of walls through out the house!! Disclaimer: this post does contain affiliate links. However all recommendations and reviews are purely my own and items used have been purchased with my own money. I ?hope you find them helpful if you are trying to create the same “look” in your own space. 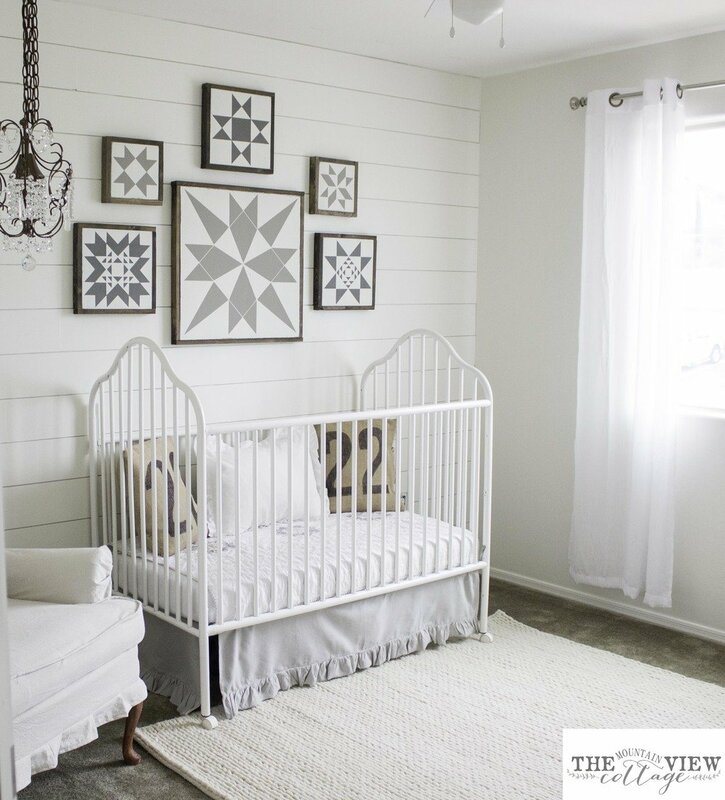 If you enjoyed our nursery reveal and would like to save it for later be sure to pin the image below! Thanks so much for stopping by!! I came across your blog while looking for ship lap ideas. 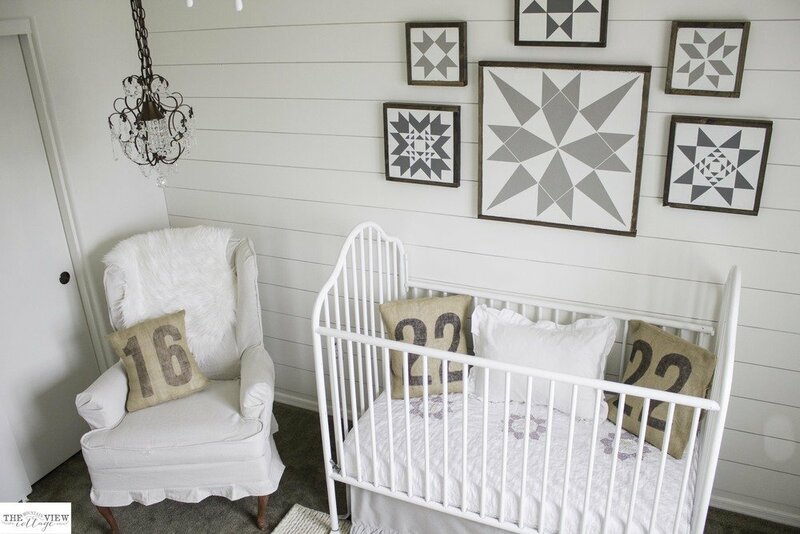 I love the nursery and was wondering where you got the pillows and pictures above the crib. Its a similar look that I am wanting to do for my upcoming arrival! I tried to send an email, but it wasn’t working. 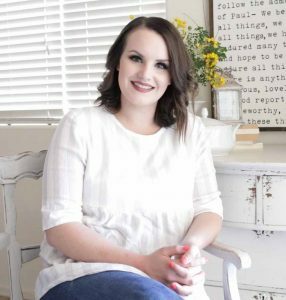 Thank you so much for your message Kelly! 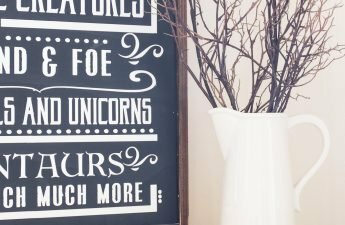 I actually made those signs but think its time to probably do a tutorial on how to make ! They were pretty simple and I think they would be a great "beginner" sign project! I also made the pillows as well and already have a "how to post" planned for those as well! Congratulations on your upcoming arrival how incredibly special and exciting! & thank you for letting me know that my email isn’t working I’ll go remedy that now! have an absolutely wonderful day! would you be willing to make the signs and pillows and sell them? I am not very crafty lol and my time is ticking for this babys arrival. I have a shop and we do a sale once a month, but we have stopped selling this design as of the start of 2016, as a rule I start fresh each year with new designs and do not carry over what I’ve done the year before with a few exceptions. I am so sorry! So beautiful! Out of curiosity, do you know what paint color is on the wall with the window? 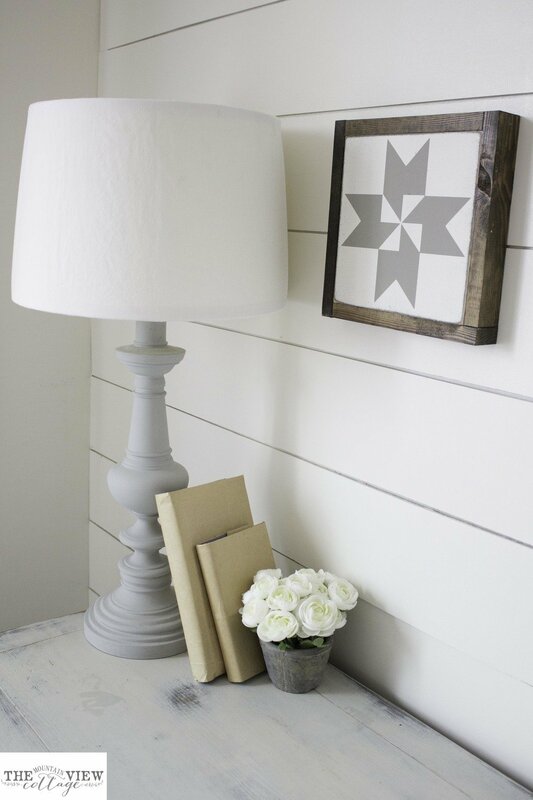 My husband and I are going to add a faux shiplap wall to our master bedroom and can’t decide whether the other walls should be white or a light color, like beige or gray. Your combination looks so perfect, I just had to ask!! Hey Charile! The colors are actually the same on all four walls! it is called Swiss coffee its a nice warm white and I have used it all throughout my house I love it! 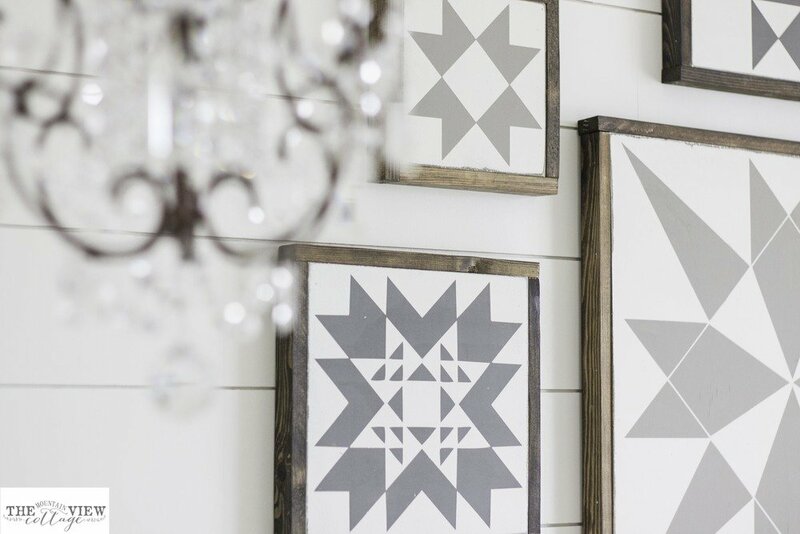 Just found your site,and love, love the quilt blocks on the wall. You mentioned a few years ago in comments that you would do a tutorial on those. Do you still plan to? I would love to make them in the same patterns. Thanks for taking the time to respond- I know you are a busy mom! I LOVE the entire design. 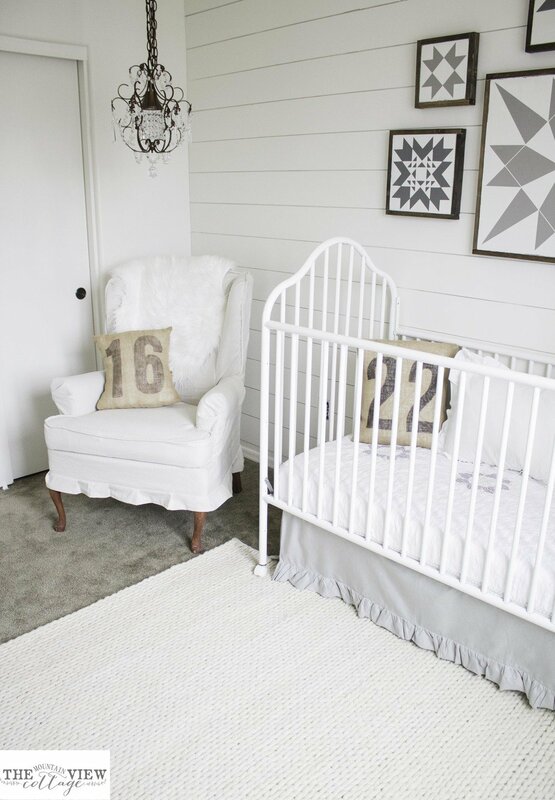 Do you have plans for a post on how to DIY those gorgeous burlap pillows? They’re stunning!